Wetter Season is here, bring on the Chrome! Its Winter time, otherwise known as the Wetter Season here in the Pacific Northwest. Just a little bit more rain than the nicer Wet Season, but enough to bring river levels up and the big fish in. This time of year I have only three things in mind. Salmon, Sturgeon and Steelhead. 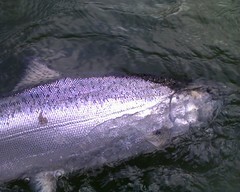 Right now sturgeon are moving into the Columbia and Willamette Rivers and they seem to get bigger every week. The bite was very slow at the season opener on October 1st, but so far every week the action has been getting better. I personally prefer the lower traffic of the Willamette River, and there are a ton of great sturgeon holes throughout the Portland area that are easy paddles. I've had the best luck using whole baitfish. Fishing for sturgeon is about as easy as can be. Find a deep hole 70+ feet. Anchor up alongside or upstream. Tie on bait (herring, anchovie, shad, sandshrimp, squid, red/orange gummy worms, and much more), heavy lead, toss into hole, wait. Big native Fall Chinook salmon are pointed at coastal rivers ready to make the move on up. 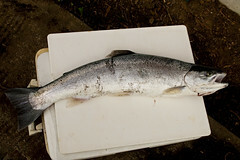 Tillamook Bay fishing has been great the last couple and you can expect to see these big fish push their way up the Nestucca, Wilson and Kilchis Rivers now that the rains have come. These rivers are easy to drift, especially if you have a smaller kayak. My Trident 15 is too big for these rivers, but anything under 13' will feel right at home. The Fall Chinook run is brief, but does provide some killer fishing. General tactics including bobber dodging, flatlining plugs, and back-bouncing eggs will slay these fish. Be prepared to fish all three techniques with three different rods. If you find a good spot, work your way through all three setups before moving on. If there are fish in the hole, at least one of them will provide some good action. But the Wetter season is dominated by steelhead. For those of you on the eastern sides of the Cascades, you shouldn't be reading this. You should be out fishing. A huge late summer run of Steelhead have been working your way through the system and the States of Oregon, Washington and Idaho are overwhelmed! They are REQUIRING people to keep every hatchery Steelhead you catch. On top of that, they have upped limits from two fish a day, to four fish. People have been catching limits pretty quickly on the Columbia, Clearwater, Snake and Grand Ronde Rivers float-drifting darker colored 1/8 and 1/4oz jigs, and back bouncing shrimp and eggs. There are several more options if you want to work the bank this winter. Check out the November issue of Northwest Sportsman Magazine for some great locations and tactics for Winter Steelies. There's also a great article by Mark Veary on kayak drift fishing this winter. Check with local guides on SteelheadUniversity.com (Washington) and TheGuidesForcast.com (Oregon), and local tackle shops for more specific information on good areas to drift!